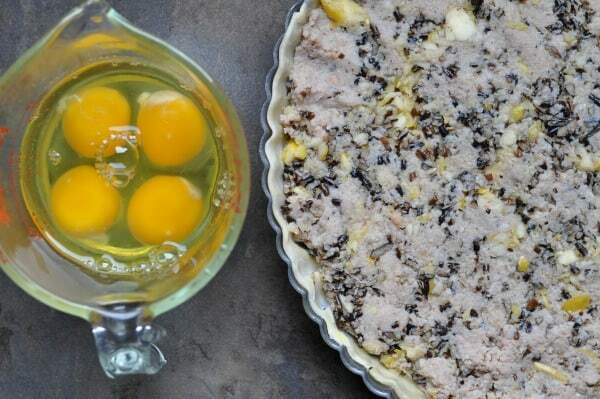 My recipe for Wild Rice Egg Tart was featured on Nellie Bellie where I contribute easy and creative recipes. Coming over from Nellie Bellie? Thanks so much! I love making egg pies. That’s what I call them at my house. My kids understand pie. And they love pie. I wasn’t sure what they’d think of my latest creation of combining eggs, wild rice, chicken sausage and apple into a Wild Rice Tart. No, that’s true, I knew they’d probably fuss and refuse to eat it, but I tried anyway. 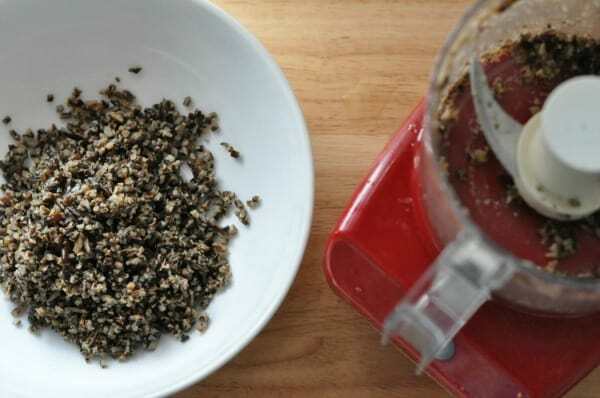 I chopped up the wild rice with my Kitchen Aid Chopper (affiliate link). This little appliance has stood the time, seriously. It’s over 10 years old and works great for small chopping jobs. I chop the wild rice, chicken sausage and apples. Then get your pie crust ready. I use a Pillsbury refrigerated one because I had one in the freezer and it fits perfectly in my tart pan. Also, our dishwasher broke this week and if I used any dishes not absolutely necessary I was going to get in trouble with our head dishwasher, my husband. Press the crust into the tart pan and I like to give it a brush of egg wash. It helps bake the crust, you can also blind bake it (directions in the recipe). That will really help crisp up the crust. I didn’t feel like doing it and my family still loved it. Get your wild rice, meat and apple pressed into the tart pan. 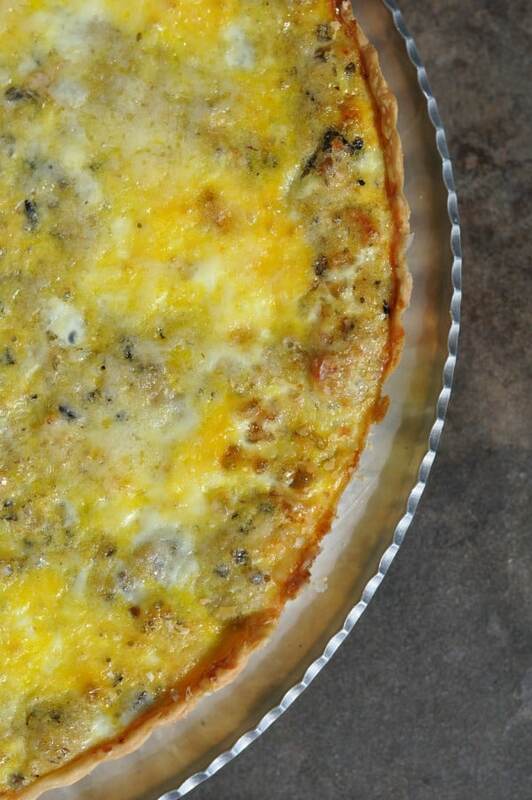 Beat eggs and then pour them right on top of the tart. 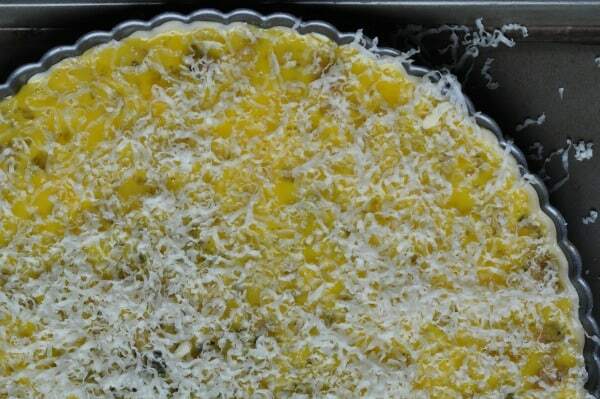 Grate cheese on the tart and then bake for 30 minutes. I served this to my family and my kids ate seconds! Seconds. I feel like I hit a mom home run. This is a super easy dish to make and then freeze the leftover slices individually in parchment paper for super easy reheating. For more freezer-friendly meals and tips, check out my new book, Freezer Meals for Moms. In a food processor, finely chop the wild rice, chicken apple sausage and apple. 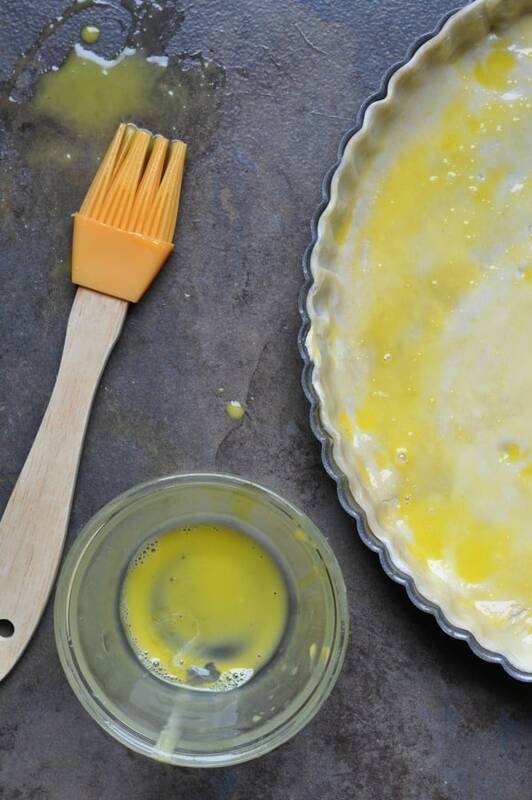 In a tart pan, press in pie crust. 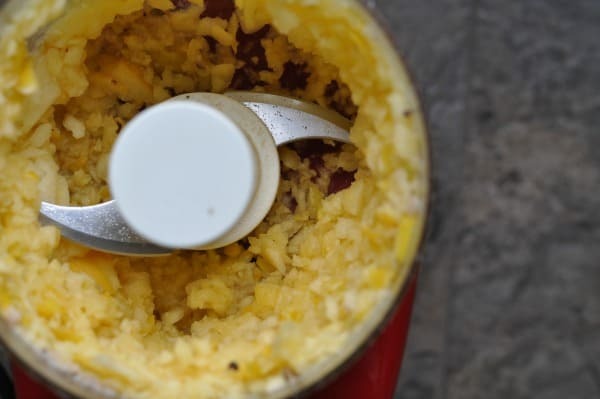 In a small bowl combine 1 egg yolk and 1 tsp water (mix until combined). Brush crust with egg wash. If you desire a crispy pie crust, blind bake the crust by baking in an oven for 10 minutes at 425. Press in wild rice, chicken and apple mixture. In a small bowl combine four eggs and beat until creamy. Pour over tart. Grate cheese on top of tart.